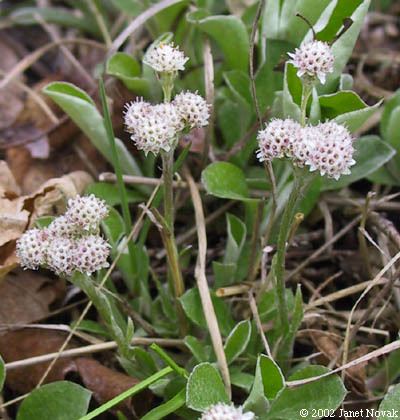 Antennaria plantaginifolia. © 2002 Janet Novak. ct-botanical-society.org. (Accessed 3/2014). Leaves at the base of the plant (basal leaves) rounded, 1.4-6 cm long, 1.5-4 cm wide, with 3 or 5 major veins, very hairy below, leaves of the stem smaller. Flowers white, very small, in dense heads, flowers largely hidden by 3-4 rows of papery, basal bracts.